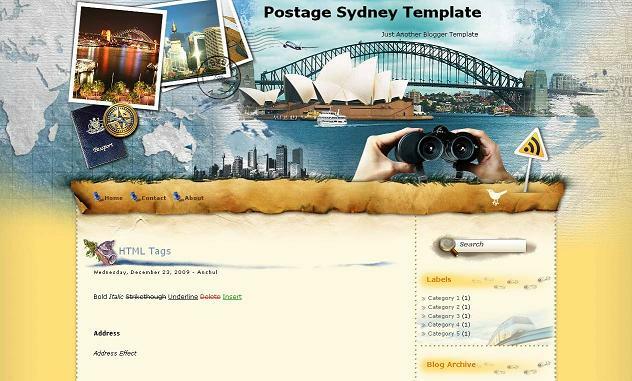 Postage Sydney blogger template is a two column blogger template with post section to left and sidebar to right.The theme is designed by templatelite and converted by me to blogger.The template contains very high quality images with many built in widgets inside it.Top menu links are ready for you.Search box is ready inside your blog with rss button to its top.Just click on the download link and enjoy using it.Twitter widget has also been made in it.Seo for title has already been done.If you want to have psd files for it you can buy them at wordpress download link. Other blogger templates you may like are My Sweet Diary and The Journey. Just find for below Word and replace it with your twitter username. 2. but when i click read more and the image with link. It is the hack me using. is disqus comments for blogspot search engine friendly? can you get this template?? @zeetips ya no problem in using it.We even cant say blogger comments seo friendly.